Non in Paesi Bassi? Scegli la libreria del tuo Paese per vedere i libri disponibili per l'acquisto. Sandy and Lily Johnson's son, Colt, has grown up and become a horse trainer. Some call him a whisperer. He decides to go out on his own to see if he can make a living as a horse trainer. He meets lovely Mandy Evans, a children's counselor. Riding horses in the beautiful hills by Donner Lake and Soda Springs, they fall in love. But there's an old boyfriend still in the picture and a needy mother who wants more than Mandy can give her. A new love is rocked before its foundation is even established. Will they be able to put the necessary pieces together or will outside interference tug them in opposite directions. Nothing worth having comes easy. 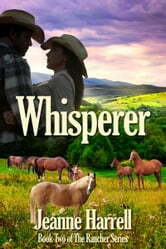 This is the follow-up story to Rancher's Girl.